A native of Europe, the elm leaf beetle was first identified in Australia in 1989, along the Mornington Peninsula. The elm leaf beetle is approximately the size of a large grain of rice, appearing dull green in colour early in the season, with the colour becoming more defined as the season progresses. As the beetles feed their colours become more defined, the wing case colours intensify, appearing as dark olive brown and iridescent green parallel stripes that run length ways. 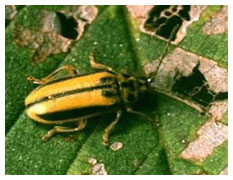 The most severe damage inflicted by the elm leaf beetle occurs mainly during the larval stages of the insect’s lifecycle, skeletonising, the leaves and destroying the tree’s ability to achieve photosynthesis and produce reserves of energy that carry it through its dormant period. 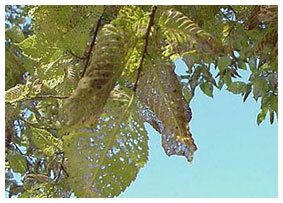 Damage caused by an adult elm leaf beetle is evidenced by the leaves taking on a ‘shot hole’ appearance – and this damage continues right through the growing season. 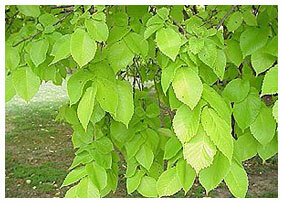 Read our fact sheet on Elm Leaf Beetle.